Command-line management through atomiadnsclient (atomiadns-client). 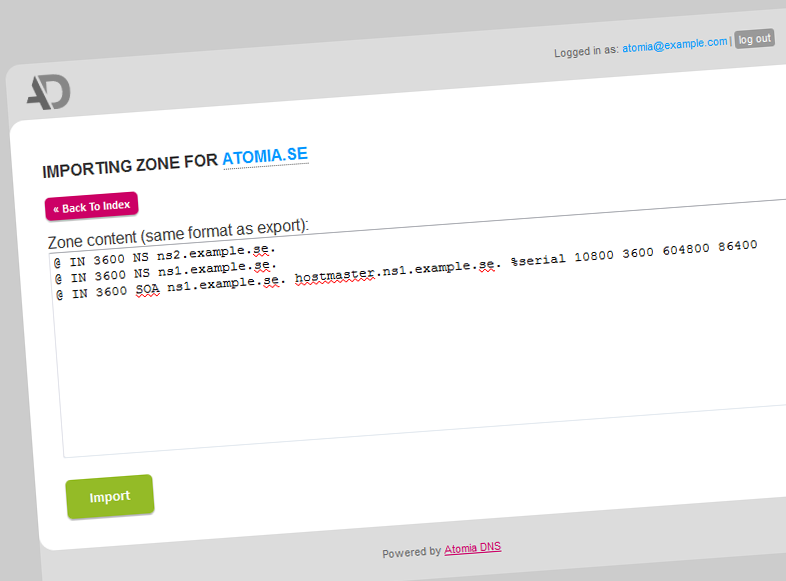 Zone file import through atomiadns-zoneimport. Helpers included in the sync agents. Atomia DNS uses the ISC license. See https://github.com/atomia/atomiadns/blob/develop/LICENSE.txt for details. 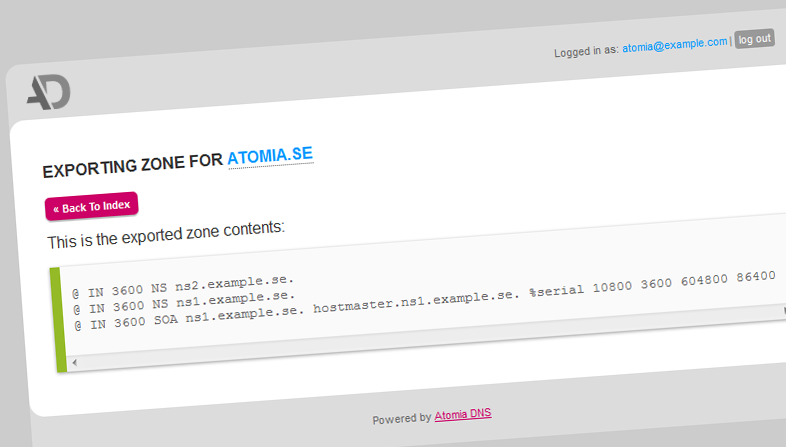 Atomia DNS can automatically sign all hosted zones, out-of-the-box without manual labor. It was battle tested during the roll-out of DNSSEC for the Swedish top-level domain in late 2011. Atomia DNS comes with an easy-to-use API that allows you to integrate it with your existing hosting solution. Atomia DNS also includes a command line client and a web-based control panel. Atomia DNS is open source and you are more than welcome to contribute to the development of the product. It is also free to use. Atomia DNS has been used in large-scale production environments for several years and was built with mass DNS hosting in mind. No matter if you host hundreds or millions of DNS zones, Atomia DNS will do the job. Our intention with Atomia DNS is first and foremost that you integrate it with your current system or control panel. However, we do recognize the need for a simple control panel for those who want to use Atomia DNS as a stand-alone product. For this purpose we have create the Atomia DNS Web App — a simple, intuitive control panel to manage DNS zones. 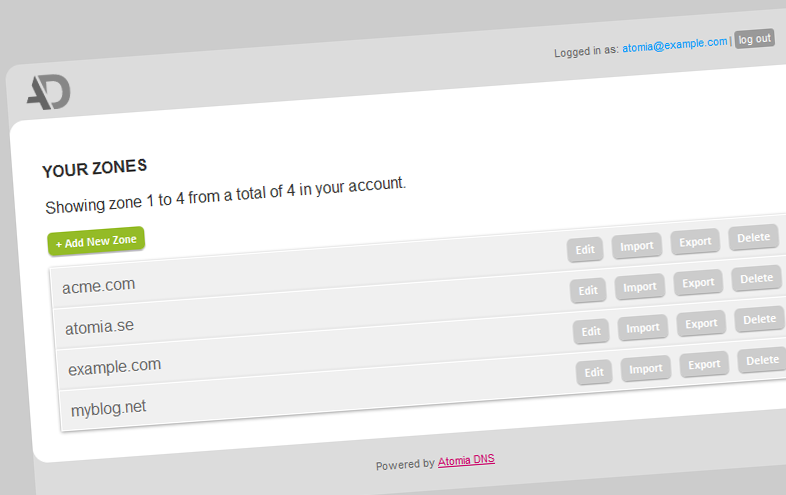 While the Atomia DNS Web App still is in an early phase of development, it is fully functional. Since it is open source you can extend it with any additional features you want to have. 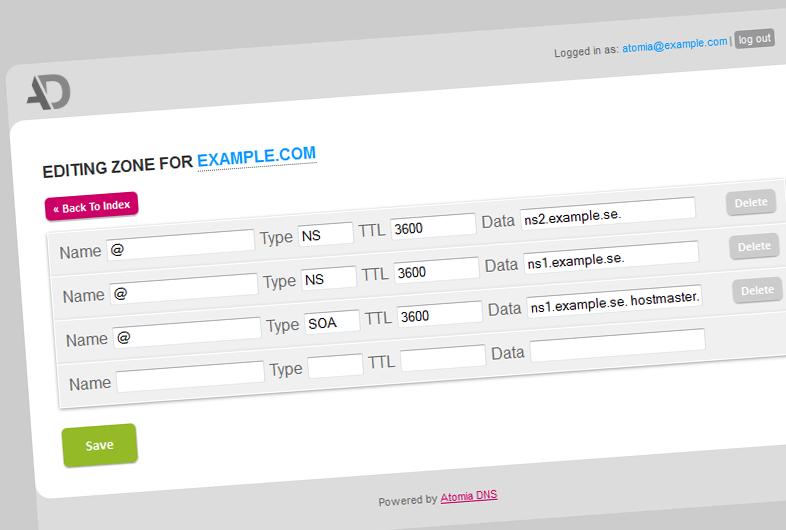 The Atomia DNS Web App is built using Node.js and the Jade template engine. Check out our Get Started pages for instructions on how to install it.